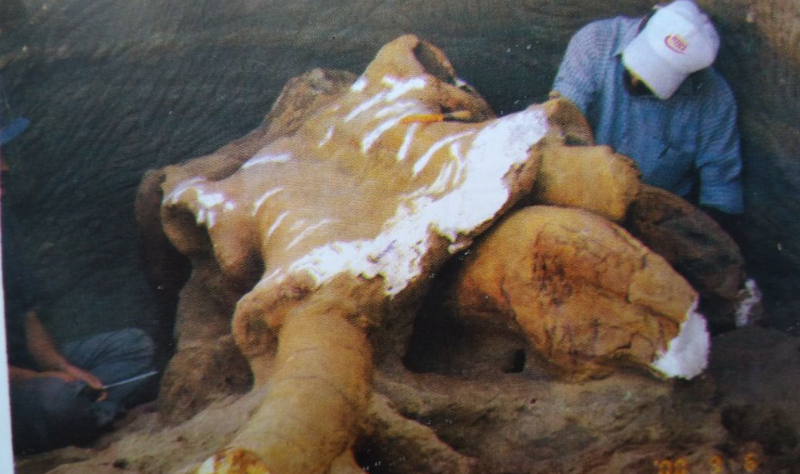 During a study tour on 31 August 2000, when some teachers and students of Degree College Sopore discovered a fossil of a mammoth at Pampore, 15 kms south of Srinagar, geologists in Kashmir were excited. The find, comprising a skull with complete lower and upper jaws, a broken tusk and a vertebra, was highlighted as ‘the largest ever unearthed in the subcontinent’. A little distance from the site a huge tusk measuring 8 feet and 3 inches was also unearthed. Further excavation threw up 58 ‘Paleolithic (stone) and 3 bone tools’ in the same fossil bearing strata, a claim yet to be scientifically ascertained. As news about the discovery spread, the site turned into a huge attraction with enthusiastic people jostling each other to have a glimpse of the find. On the basis of carbon dating of upper strata of the Pampore karewa, the fossil was estimated to be at least 50,000 years old. The fact that it was discovered from lower stratum its life further going back in time — may be a million years or more — remained a possibility. Experts believed it had catapulted Kashmir into the great mammoth era. The significance of the find lay in the strong prospect of its redefining natural and climatic history of Kashmir. Given the ‘discovery’ of stone and bone implements, the find could alter the widely held belief about the oldest evidence of human presence in the subcontinent, especially Kashmir. In short, the unearthing of the fossil was one of the most significant archaeological developments regarding Kashmir’s past. The euphoria was still high when in 2007 news broke that the precious find was surreptitiously removed from its makeshift tin shed at the excavation site. On 3 April 2007, Dr. Abdul Majid Dar, one of the two geology teachers who had chanced upon the find, visited the site and, to his shock and disbelief, found “both the skull and the tusk are missing”. He feared that these had been smuggled out of Kashmir for sale in the international market. The incident left people in general and lovers of Kashmir heritage appalled. Incidentally, five years before the theft, fears had been expressed in the State Legislature about the safety of the find whereupon the Government had assured of “proper watch and ward” arrangements of the find, besides promising to declare the area as a “protected site once the authenticity of the findings is established.” However, the assurance proved false. As days passed, the fossil was found parked in the University of Jammu’s Geology Department. It turned out that a teacher of the University of Kashmir who was earlier co-opted for excavation of the fossil, on his return to University of Jammu — his parent institution — had illegally taken away the prized collection and, shockingly, also bragged about the theft. “Yes, I have shifted it. I didn’t need permission from anybody. I have done whatever I had to do. They can go to court”, he was quoted as saying in the Himalayan Mail, a subsidiary publication of the Indian Express from Jammu. When voices for getting back the stolen fossil began to rise in Kashmir, an artificial opposition by students of the University of Jammu was engineered to thwart its return. A four- member recovery team sent to Jammu met with hostile situation there and returned empty handed. In 2011, a shocking news came from Jammu that “the rare fossil is gathering dust in the corridor of the Jammu University’s Geology department” and that “exposure to changing climatic conditions and the elements in the air for over eight years has started taking its toll on the fossil, with officials helplessly watching its destruction.” Ten years after its illegal removal from Kashmir and assurances on its return held out by the then Vice Chancellor, University of Jammu who is now an adviser to the Chief Minister, the fossil is still illegally held by the University of Jammu. In fact, it is now permanently installed at the newly set up Wadia Museum of Natural History giving enough indication that the University has no plans to return it to Kashmir. Not to talk of return, it even refuses to share information on the status of the fossil terming it ‘out of the realms of public interest’. In response to an RTI application seeking information about the status of the fossil and why it was not returned to Kashmir, the University asked the applicant to “justify the public interest involved in the disclosure of the information sought”. When confronted with a counter argument that if seeking information on the theft of a priceless object holding information on natural and climatic history of the land of 7 million people was not of public interest what else would be, the PIO of the University wrote back that the information “will be supplied in due course”. The ‘due course’ being an undefined timeline, it might entail decades. The University of Kashmir that financed the excavation of the fossil, has taken the cover of a ruling by the ‘Apex Court’ in a certain case to deny information. Obviously, both universities were helping each other out in keeping facts from the public domain. Incredibly, nobody was held responsible for the theft, nor for illegally holding the fossil. The height of insensitivity of the Government could be measured by the fact that it failed to perform even the basic responsibility of filing a case against the daylight robbery. An inquiry committee announced by the University of Kashmir in 2007 never took off. The Chief Minister’s instructions to get back the fossil from Jammu remained proverbial Hukm-i-Nawab ta dar-i-Nawab (The ruler’s orders are obeyed not beyond his door). The discovery and purloin of a mammoth fossil from Kashmir was not the first incident of its kind. An elephant tusk and bones were excavated from the same area in 1931 by Dr. de Terra, then research associate at the Carnegie Institution of Washington who was twice sent on expedition to India by Yale. On his return from the first expedition, Terra took the mammoth with him and installed it in New Haven. When Maharaja Hari Singh came to know about it, he wrote to the University asking for the return of the mammoth. Although Terra claimed that he had a written authorization from the Kashmir Government to take the fossil out “but as I wanted to go back to Kashmir, I decided to return it.” Hari Singh had the mammoth installed in his palace for, lo and behold, “using its tusk as coat-hangers”. When in 1935 he left Kashmir where he had “extracted so much inspiring information” in his search for traces of prehistoric man, Dr. de Terra felt “as though we had laid a foundation on which prehistoric research on early man in India can be built in the years to come.” The 1931 fossil was shifted to the Sri Pratap Singh (SPS) Museum Srinagar. The SPS Museum was established in 1898 at the Maharaja’s Summer Guesthouse. Subsequently, it developed into one of the best museums in the subcontinent, displaying artefacts and objects, which it has now about 80,000, covering subjects like archaeology, numismatics, decorative art, arms and armoury, paintings and textiles. Nineteen years after its establishment, a major theft took place in the SPS Museum. The stolen objects included precious Jamawars, silk brocades, Shah Pasand Kani Tosa Shawls, Pashmina robes, Agate and Turquoise stones. The thieves broke open six almirahs and 3 glass cases to make good with the loot. On 16 December 1917, the Curator of the Museum informed the Home Minister about the theft of 68 articles related to the Afghan, Sikh and Dora rule over Kashmir. The burglary happened in spite of the fact that the Museum was guarded by two policemen, one posted on its southeast and the other on western side. One guard, as police report revealed, was posted at a point where he “could see nor observe the commission of burglary” while the other was in a position to observe the burglars inside the museum or hear “cracking of opening of doors and almirahs” but was “unable to give any information.” The electric lamp in the museum was found broken and its switch removed. The two night watchmen on watch and ward duty of the Museum and the nearby observatory also expressed ignorance about the incident. That burglary was committed in spite of the police guard annoyed Maharaja Pratap Singh, after whom the museum is named. In mocking remarks about the police, he observed: “This theft has been committed in a state building, and if the theft remains untraced it will be very disgraceful on the part of the Kashmir police. The very fact of a theft having been committed in ajaib gharshows that the thieves are not afraid of the Kashmir police.” As police failed to make any headway in the case, a reward of Rs. 1,000 was announced by the Government for information leading to recovery of the stolen objects. Soon thereafter, on 26 March 1918, Kashmir Police claimed partial recovery of the stolen property, including 23 shawls and some stones, from a Nallah near the Maharaja’s Palace at Shergarhi. Major part of the looted property, however, remained untraced. In 1938, thieves again struck the Museum, broke open glazed showcases of its Art Section and stole about 70 silver and brass objects. The theft occurred during the intervening night of 26 and 7 October and was reported to the police by Superintendent, Archaeology, Research & Museum Department. The stolen objects included silver teapot, sugar basin, cigarette set, pandan and silver and brass jewellery. In 1973, another major theft occurred at the Museum. On 10 August, Curator J L Bhan reported theft of 5 bronze and 1 wooden antiques. The stolen objects included Standing Buddha (Bronze), Jain Figure, Buddha (Wooden), Tara (Bronze), Seated Buddha (Bronze) and Ardha Nari Shawara (Bronze). In the FIR, Bhan stated that at 11 AM when the Museum was opened a showcase in the Archaeology Section was found broken open and the six antiques missing. Within hours of filing an FIR about the theft, however, he informed the police that one object, Ardha Nari Shawara, was found in the Textiles Section near the window. On the previous day, he claimed, the Museum was closed in the presence of the in-charge guard. The police investigated the case without success. In 1975, the Deputy Inspector General of Police reported that the “theft of articles has been closed as untraced”. 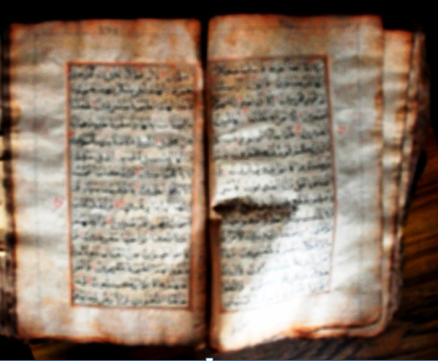 Thirty years later, the Museum was again struck by thieves, this time an invaluable 17th century Arabic manuscript of the holy Quran was stolen. On 12 July 2003, Jamshed Ahmad, Curator of the Museum reported to his Director that “one manuscript titled holy Quran bearing seal of [Emperor] Aurangzeb” was found missing from the showcase “at 3.30 P.M. yesterday (11 July 2003)”. The manuscript, believed to have been written in the hand of the Mughal ruler, besides its antique value was an object of religious reverence for the people in Kashmir the theft of which caused great anguish. The burglary was reported to the police for investigation and recovery of the stolen object. On 6 July 2004, the Station House Officer (SHO), Police Station Raj Bagh wrote to the Curator of the Museum: “During the course of investigation many persons were questioned regarding the occurrence but unfortunately no clue has been found.” The letter added that “there is no hope to find out any clue regarding the occurrence and the case has been closed as untraced”. In 2013, however, the Chief Secretary, referring to a report by SHO, Police Station Raj Bagh, informed the J&K High Court that the case was “under investigation with the Crime Branch, Srinagar”. The High Court was not satisfied with the probe and on 22 September 2016, ordered its transfer to the Central Bureau of Investigation (CBI which is now investigating the theft. In 1995, Indian paramilitary forces during a raid on a suspected militant hideout at Chandpora, Shalimar, claimed recovery of 35 (some newspapers mentioned 32) antique objects related to 8th-10th century AD which made big news. At a press conference, the recovered antiquities were displayed. An official of the SPS Museum was called to ascertain the antiquity of the objects. “We had gone to seek custody of the recovered objects but the security forces refused to give those to us. Overnight, the antiquities were shifted to New Delhi and handed over to the National Museum”, recalls Jamshed Ahmad. The images were of Hindu deities and mostly in stone. According to a former officer of the Department of Archives, Archaeology and Museums, the objects are now on display at the National Archives. 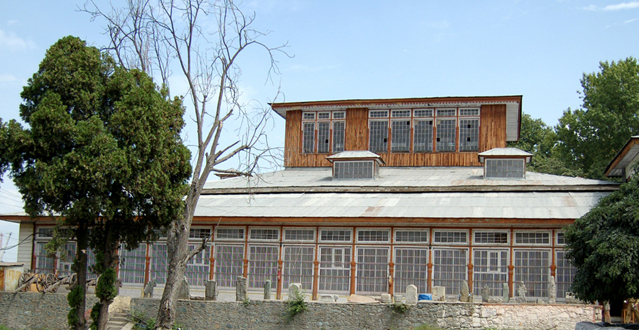 Several incidents of theft at the SPS Museum did not come in the way of Jammu & Kashmir Government liberally gifting prized heritage objects to various museums and institutions. The first documented beneficiary of the government munificence was Moti Lal Nehru Children Centre (MLNCC), Lucknow. In 1958, the MLNCC was gifted 30 numismatics, natural history and decorative art objects. However, in 2013, when in pursuance of a court order the Government of Jammu & Kashmir was asked to get back all the gifted artefacts, the MLNCC expressed inability to locate the objects. Barely two months after a major theft in the Museum in 1973, as heritage lovers in Kashmir were still under shock, the State Government gave a generous gift of 35 precious artefacts, including 31 antique coins, to the Government of Himachal Pradesh for setting up a museum at Shimla. On 26 September 1973, an order was issued, pursuant to a decision of the State Cabinet headed by Chief Minister Syed Mir Qasim under which the artefacts were taken out of the SPS Museum and the Research Section of the Department of Libraries and transferred to Shimla. The objects included coins, manuscripts, armoury and painting related to ancient and medieval Kashmir. The copper and silver coins dating from the earliest Hindu period (225 AD) to the Dogra rule (1846–1947) represented the reigns of Spalapati Deva (225 AD), Tormana (500 AD), Samanta Deva (900 AD), Ananta (1028 AD), Kalasa (1081 AD), Dida (1085 AD), Harsha (1089), Zainul Aabideen (1479 AD), Fateh Shah (1483 AD), Akbar (1556 AD), Jahangir (1627 AD), Shah Jahan (1658 AD), Aurangzeb ( 1707 AD), Shah Alam (1712 AD) and Farrukh Siyar (1719 AD). Other artefacts included a Persian manuscript, Magaz un Nabi (Wars of the Prophet) by famous 16th century Kashmiri poet, scholar and spiritual personality, Sheikh Yaqoob Sarfi, one gun of the Dogra period, a Sharda manuscript and a Kashmiri painting depicting Swchanda Bhairva. The largest ‘gift pack’ of 209 antiquities, however, went to the newly set up Central Asian Museum of University of Kashmir in 1980. Three days after a missive from the Chief Minister’s Office, Director Archives, Libraries and Museums, on 25 August 1980, ordered that “all Central Asian Antiquities be transferred to Prof. S. Maqbool Ahmad, Director, Centre of Central Asian Studies, University of Kashmir on the day he reports in the S. P. S. Museum, Srinagar, under proper receipt. The order was “issued in pursuance of the orders of the Chief Minister.” The artefacts were taken out from textile, decorative art, archaeology and numismatics galleries. When in the light of a court directive in 2012, the SPS Museum asked for their return, the Centre of Central Asian Studies refused, arguing that these were properly transferred and registered with the Government of India under the Antiquities and Art Treasure Act of 1972 in the name of the Central Asian Museum. Subsequently, however, it relented. Besides gifting away artefacts from its collection, the Government has exhibited casual approach towards preserving and protecting Kashmir’s heritage wealth, a glaring instance of which is sending outside the Valley ‘Stone Age’ objects for carbon dating and then caring less to bring them back. In 1963, these artefacts including stone axes and tools made of animal bones, unearthed from the Neolithic Burzahom in 1930s, were sent to a laboratory in Calcutta (now Kolkata) to scientifically determine their age. The objects were never brought back. Fifty-four years later, nobody even knows where the treasure is located now. Further excavation at Burzahom by Dr. de Terra and his team was stopped due to sinking of land there. However, the work was resumed many years later when Superintending Archaeologist Triloki Nath Khazanchi was able to unearth more Stone Age weapons. Old hands in Kashmir archaeology recall at least two incidents when precious artefacts were stolen from official premises. In the first case, Khazanchi had discovered a Buddha image at Harwan which was still under his study when allegedly it disappeared from his table. In another case, a 7th-8th century stone Shivlingam discovered from Parihaspora and weighing 5–6 quintals went missing from the Darbar Garh premises before it could be accessioned and transferred to the Museum. About four decades back, poet and filmmaker, Faiyaz Dilbar was doing a write up for a radio talk on heritage in which connection he visited the SPS Museum a couple of times where his attention was drawn by a small but elegant bronze statue. “It was a beautiful sculpture with Shiva in the middle and different incarnations of Vishnu around its oval shaped frame. After a fortnight, when I again visited the Museum I was shocked to see the head of Shiva missing”, he recalls. Around this time, antique traffickers in the Valley were known to be active, with a Srinagar art dealer nicknamed after a rank in one of the four suits of playing cards, allegedly being in the forefront. On 17 October 1979, stone images and stone fragments related to 10th-11th century AD were discovered from Khurhama (Kupwara). Soon thereafter, there were allegations that some of these objects were pilfered during shifting between the excavation site and the Museum. A criminal case was filed against an officer of the Archives, Archaeology and Museums Department. The missing objects were believed to be of high antique value. As part of the investigation, the Anti-Corruption Department seized 22 objects from the Museum which remained in its custody for 24 years until released on 29 January 2013 through intervention of the court. The case is still undecided even as the accused official has since passed away. Earlier, in 1965, as many as 461 copper coins and one fragment of copper ring were unearthed by one Ghulam Rasool Kumar from his private land at Kulgam in South Kashmir. He refused to part with the treasure when the government asked him to handover the find. The matter went to the Court of Munsif (Magistrate) Kulgam which seized the coins in connection with case titled State v/s Ghulam Rasool Kumar and Others. The artefacts are still in the custody of the court despite repeated requests for their release. Illegal trafficking of priceless objects has slowly depleted heritage reserves of Kashmir. 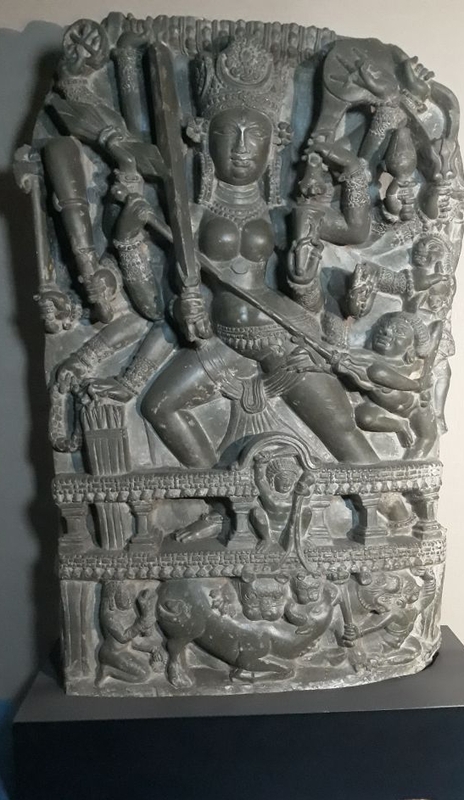 The long turmoil and the resultant law and order failure in Kashmir beginning 1989 is especially believed to be a period when art smugglers robbed Kashmir of its priceless articles “which now adorn homes of private collectors and museums in western countries.” In 2012, a 10th century Durga statue in green-stone, stolen from a temple in Tengpun village of Pulwama, was spotted at Linden Museum, Stuttgart (Germany). The role of Indian art dealer, Subash Kapoor, who was arrested in Germany in 2011, was suspected in smuggling the idol out of Kashmir. During her visit to New Delhi in October 2015, German Chancellor, Angela Merkel returned the 18-armed Durga sculpture which is now installed at the SPS Museum. Former Director, Centre of Central Asian Studies, Dr. Ajaz Ahmad Banday was “surprised’ to see Harwan Tiles at a museum in France”. A 6th century AD Gajalakshmi (Stone) was discovered in village Brah of Anantnag district during early 20th century. The photograph of the image was first published in 1913. Ever since, host of archaeologists, including Banday, have used the picture in their publications but nobody knew where the image was actually located until 2014 when it was discovered in Japan with a private party. So for as structural and archaeological heritage of Kashmir is concerned, most of the important sites and monuments in Kashmir like Burzahom, Martand and Awantipora– there are 31 ASI protected sites and monuments in Kashmir — are under the supervision of the Archaeological Survey of India (ASI) which is accused of leaving these literally uncared for since 1990. The ASI, however, claims that “all the Sites/Monuments are well preserved, maintained and in presentable condition.” The organization has not undertaken any excavation in Kashmir since 1998–99, and no significant excavation after Gufkral in 1981–82. The J&K High Court expressed lack of satisfaction over the working of the ASI in Kashmir. In an interim order pronounced on 11 December 2012, the Division Bench observed: “We have been taken through the photographs which show that efforts [by the ASI] are being made to discover and identify these excavated sites but no steps have been taken which may lead us to record our satisfaction”. Against well established norms, the ASI has not set up any site museum at its archaeological sites in Kashmir to showcase the excavated objects. Instead, it is accused of shifting the artefacts outside Kashmir. Quoting an instance, senior journalist, Ghulam Nabi Khayal refers to “[t]he Terracotta tiles of 2nd and 3rd [century] BC excavated here were shifted to Ramgad, Udhampur in the name of security and thus Kashmiris were deprived of their rich history.” The ASI, Srinagar Circle admits that “a portion [of the excavated material in Kashmir] has been shifted”, for, what it describes, “its reporting part.” It attributes its failure to build a site museum in Kashmir to “land dispute”, as if every ASI protected site is in dispute. In a situation where the Government and institutions have literally abdicated their responsibility to stand guard against loot and rot of Kashmir’s rich heritage, journalist and social activist, Imdad Saqi woke people up to the perilous state of affairs. In 2007, he filed a PIL in the J&K High Court through his Valley Citizen Council seeking appropriate directions for the protection and conservation of Kashmir’s artefacts, monuments and excavation sites, and return of artefacts gifted by the State to different museums and institutions. The PIL revealed a sad tale of Government negligence and insensitivity. Saqi was able to convince the Court to take cognizance and order return of the treasure gifted away by the Government. Thanks to his activism, the SPS Museums has received back 35 artefacts it had gifted to a museum in Shimla in 1973. Another 209 Central Asian antiquities were also returned by University of Kashmir. The 22 artefacts seized by the Anti Corruption Department in 1979 too were released and received in the Museum. More significantly, the PIL has renewed hopes of recovery of one of the most precious artefacts of the Museum — the 17th century manuscript of holy Quran bearing the seal of Aurangzeb — after the High Court ordered the CBI to investigate its theft. The Court was not satisfied with the investigation by the Crime Branch. The Government’s insensitivity is further amplified by one of the least talked about, yet serious case of heritage plunder — the pillage of Valley’s geological and heritage treasure — its karewas — happening under its nose, if not with its connivance. World over, the karewas are valued and explored for global climate record of the recent past — so vital for predicting future climate. Likewise, most significant evidence of Kashmir’s earliest human life like at Burzahom and Gufkral were discovered from the karewas. Sadly, the Government appears working hand in glove with land mafia in vandalizing these scientific and anthropogenic sources. Massive construction activities, especially filling of flood plains and marshes for building new housing colonies and laying of railway track and new roads in Kashmir, has resulted in destruction of its karewas. Another instance of Government insensitivity is reflected in the construction of the Tehzeeb Mahal (Cultural Center). After several foundation-laying ceremonies at different places since early 1980s and identifying some existing buildings for the purpose, the Government finally appeared making a serious effort on 22 January 2013 when it laid the first stone of the Rs. 72 crore project near the Tourist Reception Centre in uptown Srinagar. Five years and an expenditure of Rs. 4.82 crore later, the present Government has stopped funding the construction, allegedly for it having been initiated by the government of a rival party although citing unsuitability of the location as the reason. The aesthetically designed building would have added to the beauty of the skyline, besides being a centre of attraction for people and tourists for its multiple facilities like a heritage museum, art gallery, seminar hall, book shop, auditorium for literary and cultural activities, and a coffee shop. The work on the project has stopped since 2014 and reappearance of the State Road Transport Corporation buses on the abandoned site gives enough clues about encroachment of the land. One would not be surprised if the premises were ultimately claimed by a nearby located financial institution. In olden times, art traffickers and traders travelling on the Silk Road were believed to have taken out huge heritage wealth of Kashmir. In many cases, travelers and scholars collected material of immense cultural value and returned to their native places with the amassed wealth. The 7th century Chinese Buddhist monk, scholar and traveler, Heun Tsang arrived in Kashmir in 631 AD. During his two year stay, the king provided him 20 copyists for copying religious texts and manuscripts. Tsang left Kashmir through the Pir Panjal pass and visited different Indian cities. After his extensive travel when he returned to China, he had 20 horse-loads of manuscripts, books and Buddhist relics with him. The 19th century Hungarian-British explorer and the celebrated translator of Kalhana’s Rajatarangini, Sir Aurel Stein, known for his enormous contribution to the promotion and development of Sanskrit literature of Kashmir, is reviled as an “imperialist thief” for removing priceless manuscripts, paintings and sculptures during his several expeditions to Central Asia [Reinterpreting Exploration: The West in the World]. Stein comes “top of the list of offenders who removed “literally by the ton” huge heritage wealth and shipped it home.” During his fourth Central Asian visit he was forbidden by Chinese authorities from digging. One glaring instance of ‘stealing’ Kashmir’s heritage is the transfer, on the pretext of safety, of the Gilgit Manuscripts from Srinagar to Delhi in 1948. As armed conflict was going on between India and Pakistan over the status of Kashmir, Jawaharlal Nehru, Prime Minister of India, convinced Sheikh Mohammad Abdullah, Emergency Administrator in Kashmir, that these manuscripts were in danger of being lost to arson and must be shifted to Delhi till the situation in Kashmir normalized. He sent a special plane to take the manuscripts out of Kashmir, only never to be returned. With a keen eye on history and culture, Nehru knew the importance of the treasure as much as he knew the cavity in his promise to return it. As in the case of the usurped autonomy of Jammu & Kashmir, Abdullah naively waited for his friend to fulfill his promise. After returning to power in 1975, he asked for these manuscripts from Delhi but beyond Prime Minister Indira Gandhi writing to him that she has “asked details from the Ministry of Culture”, the Government of India did not pay any heed. In fact, it feigned ignorance whenever the matter was raised. An RTI application seeking information from the National Archives of India on whether it would return the Gilgit Manuscripts is awaiting answer since 20 November 2017. Notwithstanding the silence maintained by the Government of India, a former Director of the National Museum admitted that the manuscripts were in the Museum. “They [National Museum] have exhibited Gilgit Manuscripts in exhibitions as their prized possession. I have seen these manuscripts in original form and they are still kept in the National Museum” [Taing, Kashmir Qalam]. Dating back to 5th-6th century AD, the Gilgit Manuscripts hold “the key to the exact evolution of Sanskrit, Buddhist, Chinese, Korean, Japanese and Tibetan literature”[SALT, April-June 2015] and deal with the teachings of Buddhism, philosophy and social customs. The texts throw light on the social life of Kashmir’s earliest people and Buddhism, and establishment of Buddhist Vihars in Kashmir [Daik, Sheeraza]. Some manuscripts provide information on flora of Kashmir, especially the Chinar establishing its indigenous status. Kashmir having been an important centre of Buddhist faith and literature for over a millennium underscores the importance of the Gilgit Manuscripts for the land. Written on birch bark, the Manuscripts were discovered per chance by a shepherd at Naupur, a village in Gilgit, in 1931. He was grazing his sheep when he stumbled over the treasure which lay in several half-buried wooden boxes. He informed his fellow shepherds who distributed the booty among themselves. When the Governor of Gilgit, a part of the undivided Jammu & Kashmir, now a Pakistan administered area, came to know about it he sent his men to recover the find. The officials seized many manuscripts; some were destroyed by people for the fear of reprisal by the Government and some they sold for peanuts. The seized manuscripts were brought to Srinagar where Maharaja Hari Singh ordered their preservation after a team of experts attested to their immense cultural value. The first news about the Gilgit Manuscripts was broken by the Statesman on 24 July 1931. Not only the Gilgit Manuscripts, hundreds of other manuscripts sent to Delhi for repair or other purposes have not been returned. The record of the Research Library Hazratbal reveals that in 1948, as many as 212 Sanskrit manuscripts were sent to the National Archives, New Delhi which it has held back since. The manuscripts form the first 212 indexed items of the library established in 1904 as Research and Reference Department. The manuscripts mostly comprise Budhhist and Hindu religious and cultural literature and include titles like Bodha Taddhati, Hari Tattva Muktawali, Chanderaleka with commentary, Rasamanjan with commentary, Alankarodaharma, Upadesa Ratna Panchaka, Upanishads (1) Mundika (2) Prasana (3) Chchandogya (4) Kathavali (5) Aitareya (6) Isavasya (7) Mandukya and (8) Kena, Samptika Parvan of the Mahabharta with Bhavadipa, Ramaswamidha of the Padma Purana, Sisupala Vadha with commentary, Anarghareghava Nataka, Alankara Sarvasva, Alankara Vimarshini and Bhagvadgita with commentary. Kashmir has witnessed pillage of its intellectual heritage also in the shape of valuable books that people have borrowed from libraries but never returned. A former teacher at the University of Kashmir tells about a retired colleague who “refuses” to return over one hundred books he had loaned from his friends over a period of time. In 2013, the Department of Libraries and Research ran a media campaign requesting borrowers to return the books which they were withholding for decades, after a stock audit in 2011 threw up shocking statistics. From public libraries across Jammu & Kashmir, 36,696 books were ‘outstanding with borrowers’ while another 33,200 were recorded as ‘missing’. Kashmir accounted for 24,819 and 9044 books in the two categories, respectively. A substantial number of these books included rare and reference titles. Srinagar’s SPS Library alone accounted for 2616 outstanding and 5365 missing titles. The Reference and Research Library located within the University of Kashmir campus, showed 153 outstanding and 867 missing books. The defaulters with various public libraries include, besides common borrowers and middle rung officials, former heads of the state bureaucracy, advisers, administrative secretaries, and heads of the Libraries & Research Department itself. On 6 December 1994, one former Advisor to the Head of the State borrowed from a public library Travels in the Mughal Empire, Kalhana’s Rajatarangini (Vol I & II) and The Gardens of Mughals in India which are still outstanding against him. A former boss of the state bureaucracy failed to return books like Alberuni’s India, Account of an Embassy to the Court of Tashoo Lama in Tibet and History of Hindustan (2 volumes) which he had borrowed in 1988 and 1996. One of his successors has The Warning of Kashmir, Things Seen in Kashmir, Zulfi Bhuttoo of Pakistan: His Life and Times and Prepare or Perish outstanding against him since 1993.Another retains with him History of Jammu & Kashmir and Kashmir Saivism since 1997. A former head of the Libraries and Research Department has not returned Valley of Kashmir, Kashmir: Past and Present, Civil Service Examinations and Complete Guide to PSC since 1998. Another senior officer of the department, who later rose to become a legislator, has 8 books outstanding against him since 1991 and 1993 which include Kashmir Crisis, Iqbal: An International Missionary of Islam, Prepare or Perish, Kashmir: Pakistan’s Proxy War, Kashmir Under the Sultans and With Pen and Rifle in Kashmir. The ‘worthy’ defaulters include quite a few who have since travelled to the other world. At one point in time, the Information and Public Relations Department had in its Reference & Research Section one of the best reference libraries on Kashmir which is now in a bad shape due to inadequate space, lack of professional management, ravages of fire and flood, and questionable behaviour of its borrowers. Over the decades, the greens of the library were grazed by everybody — scholars, officials of the department, journalists and bureaucrats — and not all have returned the borrowed books. A serving minister has two books, Times of India Year Book 1970 and International Law,outstanding against him since decades. A former head of the Information Department who later held a constitutional position in the state is yet to return books like Buddhist Kashmir, The Western Frontiers of Kashmir, Kalhana’s Rajatarangini, Freedom at Midnight, Ghalib Shinasi and Best Quotations. Books shown outstanding against one of his successors include Islam in Modern History, Development of Islamic State and Society, Handbook of Muslim Jurisprudence and Introduction to Kashmir and its Geography. Another has Press, Politics & Public Opinion in India, and The Greatest Quotes outstanding against him since 1980s. Yet another did not return Keys to Kashmir and Qura’n-i-Sharief. A senior officer of the library who later rose to a higher academic position outside the State and has since retired, has not returned Selections from Lenin & Stalin on National Colonial Questions, Mukhtasar Tawarikh-i-Jammu, Journalism in Modern India, Anglo-American Plot Against Kashmir and Freedom at Midnight. A middle rung official has seven books outstanding against him which include Last Years of British India, Decline & Fall of Roman Empire, The Kashmiri Pandits, The Indian Press: Profession to Industry, Punjab Today and A History of Europe. Among the defaulters are men from the fourth estate also. Seven such gentlemen have not returned at least 18 reference books to the library. The titles include Gilgit: The Northern Gate of India, The Islamic Bomb, Hair Apparent, Kashmir Problem, Essential Documents and Notes on Kashmir, The Arabs, News Reporting, Journalists’ Handbook, Ladakh Crossroads, History of Freedom Struggle in J&K, Terrorism and Security, Kashmir in Sunlight & Shade, From Jinnah to Zia, Pictures of the Kashmiri Autumn, Newsweek Bound File, The Constitution of J&K, Cultural Heritage of Kashmir and Aatash-i-Chinar. In 2003–04, Riyaz Rufayee, the then Chief Librarian, Allama Iqbal Library, University of Kashmir, undertook stock verification of his collection and, to his shock and surprise, found more than 40,000 books missing. “It took me about a year to complete the job”, recalls Rufayee. The stock verification report was discussed by the Library Committee which recommended it to be placed before the University Council. At the Council meeting, the then Vice Chancellor, playing safe, declined to act on the report while he was in the chair. So did his successor. As a result, the report was shelved. Besides, thousands of ‘honourable’ borrowers, including some VVIPs like a former senior bureaucrat who later headed one of India’s leading universities, not returning books, some unscrupulous elements are said to have stolen sacks-full of books from the library during the early years of turmoil in Kashmir when the law and order in general and the administrative set up in the University had completely collapsed. A case of theft of valuable books, earlier privately talked about by some people privy to the information, recently came in the public domain through an article published in a periodical of a Government-funded institution. As is known, in the wake of Partition and resultant conflagration in Kashmir in 1947 many people from the Valley migrated, or were forced to, go to Pakistan leaving behind their properties including private libraries. These collections were given by the Custodian Evacuee Property to an institution created in 1958 for promotion of art, culture and languages in the State. Few years back, a former officer of the institution, writing for an in-house journal, alleged that some aala aur maiyari (valuable) books were swindled before landing in the institution’s library. One of his former colleagues recalls that these books came from private collections of people like Abdur Rehman Afandi. Afandi was among many people like Mirwaiz Muhammad Yusuf Shah, Brigadier Rehmat Ullah, Sana Ullah Wani of Sopore, Ghulam-ud- Din Wani of Baramulla, Ashiq Hussain of Srinagar and the Rajas of Kohli, Chikar, Dopatta and Kathai whose properties were confiscated on 2 March 1948 under the Enemy Agents Confiscation of Property Ordinance (1948). In the un-edited portion of an article, copy of which came to the fore during an inquiry into some controversial portions of a publication, the author alleges mysterious disappearance of a valuable painting which, he claims, still adorns a wall of one of his former boss’ house. Allegations of pilferage of the institution’s intellectual wealth often come up in private discussions while those who have knowledge about it avoid speaking on record. There is this manuscript titled Majmuai-e-Bayaz by Jaffer Malik that was shown outstanding against a noted researcher and son of a famous poet, who had died in the previous year. Through an order issued on 29 June 1981 the manuscript referred to as “now beyond the scope of recovery” was written off from record but allegedly appropriated by an officer of the institution. In late 1979, the institution held an art exhibition at the Tagore Hall, Srinagar which was inaugurated by the then Chief Minister, Sheikh Mohammad Abdullah by drawing a signature painting that turned out to be quite impressive. Riyaz Rufayee who was present on the occasion, recalls that the onlookers felt amazed and the paining was highlighted in the institution’s journals as a prized collection. However, it soon went missing. A former Exhibition Officer, who joined the institution in 1994, does not recall having seen the painting. The Archives Repository Srinagar has about 6, 00,000 files but, unlike sister repository at Jammu which has a larger collection, no index register. Over a period of time, some say, the repository has suffered substantial pilferage which in the absence of an index is difficult to locate. Added to it, the Government since decades has not transferred any record to the repository, save a few hundred files from the Chief Secretary’s office in recent years. The Randhawa Committee Report on the Reorganization of Libraries, Research & Museums (1976) had recommended that various government departments should “not weed out their old records without scrutiny of the Research Department, and the archives should be transferred to the Directorate.” The recommendation was observed in breach leading to the most crucial post-1947 period of Kashmir history including the Holy Relic Movement (1963–64), the Plebiscite Movement (1955–75) and the armed insurgence since 1989, not forming part of the record. Established in 1954, the Srinagar Repository houses post-1947 record of the civil secretariat and other Government departments, and ‘thousands of files’ of the Governor of Kashmir’s office under the Dogra rule. Fortunately, the great flood of 2014 did not reach the stone building of the repository but God forbid, a short circuit can blow up the paper treasure. The building is an old structure with anything but congenial ambiance for housing such a huge and important collection on Kashmir history. Few years back, the Government had started digitization of the record. Strangely, however, after completing 25, 80,000 pages the process was stopped 3 years ago. Rajinder Singh Raina, a frequent visitor to the repository, finds the record “at risk due to lack of space and absence of scientific environment for preservation and protection”. During long turmoil in Kashmir, he observes, ‘the archival record has suffered for want of proper care and management.” About pilferage of archival record, Singh cites instance of a pre-1947 file of newspaper Akhbar-i-Kashmir and a file of English journal, Kashmir Today, pertaining to 1948 which he had consulted once but found them missing during a subsequent visit to the repository. Besides individuals and institutions eating into the intellectual wealth of Kashmir, calamities, both natural and man-made, have also depleted its sources of knowledge. Massive damage to Kashmir’s intellectual heritage was inflicted by burning down of the Jamia Madinat ul Uloom, Hazratbal on 21 February 1992 turning into ashes a collection of 16,000 books and manuscripts including a 400 year old copy of Holy Qura’n, titles on history, politics and religion and works by noted scholars on life of Prophet of Islam (SAW), and Islamic jurisprudence and interpretation of Qura’n. Most of the collection was in Arabic and Persian languages with some translations also in English and Urdu. Tragically, the institution was again ravaged by fire on 30 April 2015 that perished a collection of 2700 books serving as important sources of Islamic studies bought from countries like Egypt and Lebanon. Likewise, the library of the Islamia College, Srinagar went up in flames in an act of arson in which the college was burnt on 15 October 1990. About 65,000 books were lost to the blaze including titles like Al-Khilafat: Its Rise & Fall, Literary History of Arabs, Tawaseen of Mansur Al-hilaj, acclaimed commentaries on Al-Qura’n, earliest books on the life of Prophet Muhammad (SAW) and a collection on Islamic art and science. More shocking was the fact that not a single student or faculty returned any book out of the hundreds, if not thousands, that were outstanding against them at the time of the disaster. Another educational institution that went up in flames, on 25 July 1989, was the S P Higher Secondary School (Boys), Srinagar established in 1874 AD. The biggest loss to the school was its rich library comprising over 12,000 books painstakingly built over a century. During the intervening night of 9 and 10 June 1999, the Head Office of the Academy of Art, Culture & Languages caught fire resulting in the loss of several important paintings including one of Zaina Dab, the famous palace of Zain ul Aabideen adorning the walls of the building, manuscripts, books and artefacts. Further damage was caused by water used by fire tenders to douse the flames. The Academy at a specially held presser, refuted media reports about any loss other than office record suffered by the Academy in the incident but knowledgeable sources point out that the employees of the institution were ‘directed’ not to speak a word about the fire incident. As ‘advised’, they reportedly remained off-duty on the day press conference was held in the premises of the institution. Kashmir has a long history of scholarship and private libraries. The 12th century versifier, Bilhana refers to the scholarly discussions held in his time in the high rising buildings situated on the banks of the Jhelum. His more famous contemporary, Kalhana consulted at least 11 earlier manuscripts while composing the Rajatarangini. Zain ul Aabideen, the 15th century ruler of Kashmir, had many old Sanskrit works including the Kalhana’s tome, translated into Persian. The 16th century Islamic scholar, author and spiritual personality, Shaikh Yaqub Sarfi had a magnificent library in Srinagar with a collection of 15,000 books. In 1875 when Georg Buhler visited Kashmir, he found “[a]ll the Sanskrit-speaking Pandits, as well as some of the traders and officials, possess larger or smaller libraries.” He mentions by name 22 Pandits in Srinagar city alone who possessed “the most considerable collection”. He felt that the lists furnished to him were not complete and spoke of libraries at Sopore, Islamabad and Baramulla also. Over the centuries, the tradition of families inheriting large collections of books and manuscripts lost roots among new generations who sold as scrap many rare and priceless collections. Peerzada Muahammad Ashraf who surveyed manuscript collections in Kashmir under the National Mission Manuscripts, a Government of India project, and National Register of Records to create a country-wide database on manuscripts, says that of the surveyed collections about 35,000 manuscripts in Kashmir were with private individuals and institutions. There are many more whose owners were reluctant to share information. In several cases, the manuscripts were unsafely stashed or moth infested. The largest collection of manuscripts in a government institution in Kashmir is at the Research Library, Hazratbal which has 5824 manuscripts in languages like Persian, Sanskrit, Arabic, Kashmiri, Urdu, Punjabi, Bakha, Brej Basha, Hindi, Dogri, Turkish, Pashtu, Balti, Dogri, Tibetan and English. The entire collection is digitized. Many Kashmiri Pandit families migrating from the Valley in 1990 left behind private libraries that, they alleged, were burgled or torched. Among such persons, Dr. V. N. Drabu, Trilok Koul, P. N. Kachru and Dr. K. L. Chaowdhary claimed that their rich collections of books and paintings were looted. 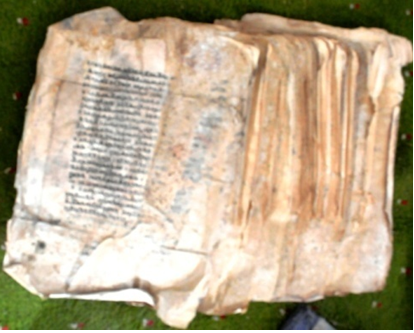 Former Director Doordarshan, Rajinder Singh Raina recalls having seen in 1993 truckloads of books and Persian and Sanskrit manuscripts being sold as raddi (scrap) at Baba Demb, Srinagar. These included inherited collections of families whose new generation sold these as scrap. Manzoor Ahamd Daik who runs Kashmir Research Institute at Brein, Nishat with an impressive collection of books and manuscripts blames Governments in New Delhi and Srinagar for their “disinterest in our rich history in the form of manuscripts and old books and, in fact, [they] would be happy if all of it was destroyed”. Daik claims to have approached every who-is-who in Srinagar and New Delhi including Chief Ministers and Prime Ministers asking for measures and financial assistance to preserve and protect treasures of manuscript wealth of Kashmir but, sadly, with no result. The only ‘noteworthy’ step the State Government seems to have taken a few years back was the creation of an independent ministry of culture whose only contribution was undesirable bureaucratic and ministerial interference in the affairs of an autonomous institution — the Jammu & Kashmir Academy of Art, Culture & Languages. As if other adversities were not enough, the flood of 2014, one of the worst that ever hit Kashmir, played havoc with libraries, especially in Srinagar city. In a radius of about 2 kilometers from the Radio Kashmir to the J&K High Court on the one side and the Amar Singh College to the Government Girls Higher Secondary School, Kothi Bagh on the other, over 2, 50,000 books were lost in Government institutions alone. According to the statistics made available by these institutions, in the S P S Library, Kashmir’s largest public library, 15,501 titles, about 5% of which were reference books, turned into rubble. Another 300 to 400 books were partially damaged. Some of the rare titles lost in the deluge included Mathnavi Maulvi Roum (1873) with commentary by Abul Ali Mohammad Behrul Aloom, Hayat-i- Afghani on history of Afghanistan (1867) by Mohammad Hayat Khan, Tazkira-e- Rausa-i-Punjab, Saheef-e-Zareen (1902) on Indian rulers by Parag Narain Bhargav, Himalayan Journals (1854) and Survey of International Affairs (1925). 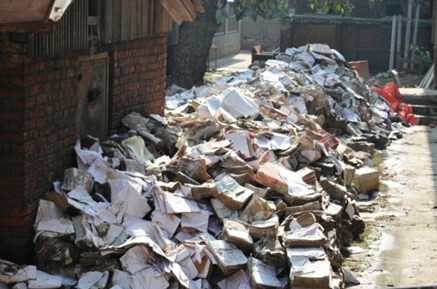 The flood took a heavy toll of books in different educational institutions. Housed in the ground floor, the Amar Singh College library lost 44,000 books out of a collection of 60,000. Fortunately, the reference section of the library comprising 16,500 reference and 3500 rare books was saved for its location in the first floor and timely rescue efforts of the library staff. The Sri Pratap College library lost around 55,000 books including about 3,000 reference titles. The flood consumed another 43,000 books at the Government College for Women and about 50,000 titles including rare books and old manuscripts of the nearby College of Education which also lost rare collection of paintings by Rabindra Nath Tagore. The library of the J&K High Court with a collection of about 15,000 books also perished, as did the libraries of the Advocate General and the High Court Bar Association. Likewise, the libraries of Radio Kashmir, Srinagar and Doordarshan Srinagar were fully consumed by the flood. The two institutions had about 8,500 and 6,000 books respectively, which included subjects like history and literature. The Government Girls Higher Secondary School, Kothi Bagh lost its entire collection of 22, 071 books (about 1,000 partially and the rest fully) including reference titles and encyclopaedias. Libraries of private schools including the Burn Hall School, Presentation Convent and CMS School also suffered huge losses. The great deluge also severely hit the J&K Academy of Art Culture & Languages where 3000 books, including 137 rare titles, were damaged. Further, from a collection of 5000 stock copies of books and journals, including a large number of out-of-print titles, published by the Academy over the past 60 years, 1050 were “severely damaged”. Most of the retrieved books “have undergone changes in their respective physical shape and form; pages stuck together”. Majority of them have been affected by fungal growth too. Out of the total 626 manuscripts of the Academy, 142 were damaged, 79 totally. Some rare manuscripts, however, were saved for being located higher than the flood level. Experts from National Research Laboratory for Conservation of Cultural Property, Lucknow, found “sporadic and fluffy fungal growth and enormous presence of blackish spores” on the affected manuscripts which had “aesthetically spoiled such valuable unbound paper manuscripts”. A serious conservation problem, they observed, was the “transfer of bleeding color from the supporting packing material to the original documents”. The Report further added: “Deposition of mud had obscured the script and in addition had caused physical deformation as visible in the below picture. Most of the manuscripts in bounded volumes were seen affected by water percolation which caused sticking of paper folios together and also stained.” The painting collection which include works of giants like M F Hussain, Subramaniyam, Laxman Pai, Gaitondai and G R Santosh, was also affected. On most of the paintings, experts found “adherence of thick muddy deposition on either side”. The only reassuring thing in this gloomy scenario is that the entire collection of Academy’s manuscripts, paintings and sculptures was digitized in 2013, making soft copies of the treasure available. The flood irrevocably damaged the Information & Public Relations Department’s 1800 international and Indian newspapers clipping files on Kashmir, representing the period from 1940s to 2000. Newspaper files from 2000 to 2014 were also lost. Earlier, books and post-2000 newspaper files had been shifted to the first floor of another building. Immediately after flood water receded, an official of the department who had painstakingly built on and properly maintained this valuable treasure asked for two computers, a few accessories and two hard-coke stoves costing in all about Rs. 2 lakh to dry and scan the files for digital preservation. The response was a snub by the senior most officer of the department: “This is a tall order”. The wreckage of the fungus inflicted files now mourns this apathy which only matches with the naked ignorance of an officer who, as head of the department inspected an archives repository and on observing piles of files of old record admonished his staff for wasting office space for ‘raddi ke dher’ (heaps of scrap) and even suggested its auction. Yet another major casualty of the flood was the SPS Museum. A team of experts from the National Museum, New Delhi assessed the damage suffered by the Museum and observed that “[t]he most affected artifacts are of organic nature. The damaged objects include 124 paintings, 38 manuscripts, 4 photo albums, 92 textile items mainly shawls, 24 papier machie [completely damaged], 6 musical instruments, 14 earthen glass ware, 4 astronomical instruments, 26 straw ware and 490 objects of natural history. The condition of Gilgit manuscripts was ‘bad’ requiring “immediate attention”. The National Museum team had submitted a conservation and treatment proposal for the flood affected artefacts that, sadly, hit a bureaucratic hurdle. The tape library of the Doordarshan Srinagar was completely washed away by the flood. Former Director, Shabir Mujahid says that many old recordings had been already lost due to failure in shifting these from obsolete to new technology, and inundation few years earlier when standing rain water gushed into a wooden barrack housing the library. The huge loss includes footage on shifting of the Moi-e-Muqaddas (Holy Relic) from the old to new building at Hazratbal, the first tele-films of Indian television in any language — Rasul Mir and Habba Khatoon, and Arnimal–, Sheikh Mohammad Abdullah’s public speech at Lal Chowk after his return to power in 1975, his funeral procession in 1982, a rare discussion on Iqbal aur Kashmir between Sheikh Mohammad Abdullah, Ali Sardar Jafri and Jagan Nath Azad and interviews with and performance by legendary Dilip Kumar, Begum Akhtar, Malika Pukhraj, Ustad Bismillah Khan and Runa Laila. Bashir Budgami, filmmaker who directed Rasul Mir and Habba Khatoon, describes the loss as “of huge proportion and irreparable”. Happily, he has a copy each of the two films which he had offered to the Doordarshan for transfer but the reply was a cold shoulder. The tape library of the Radio Kashmir was saved in the flood for being located in the first floor while its book library was washed away. The loss to private libraries in the city where houses remained submerged for over a week under 10 to 15 feet high water is equally large. Although it is difficult to accurately quantify the loss, Editor Kashmir Uzma, Javed Azar gives a rough estimate of at least 1, 00, 00 books that the flood consumed in private houses in the city. Peerzada Muhammad Muzaffar, for instance, he adds, lost his lifetime collection of about 3000 books on select topics. The loss to publishers and book sellers was enormous. Sheikh Ajaz of Gulshan Books, a leading publishing house in Kashmir, “lost over 2, 00,000 books from thousands of titles, mainly on Kashmir and Islamic literature.” His stocks at five godowns at Maisuma and Bemina were consumed by the flood. The worst hit areas of Lal Chowk, Maisuma and Bemina had about 30 booksellers whose collective loss is estimated to be anywhere between 5,00,000 to 6,00,000 books. The affected area also houses most of the newspaper offices, some of whom like the daily Aftab lost their entire newspaper archives.